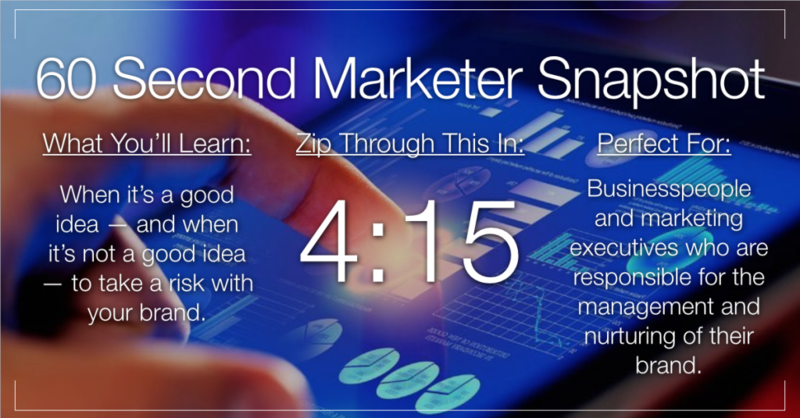 Generating awareness for your brand is a little like the stock market. You can play it safe, and generate a predictable return. Or you can take a calculated risk and win big … or lose big. Recently, I was contacted by an L.A.-based production company that’s looking for on-air talent for a TV show they’re going to produce. 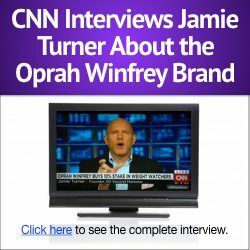 They found out about me from some of the work I’ve done on the 60 Second Marketer as well as my appearances on CNN and HLN. I’ve gone through two sets of interviews so far and will keep you posted on the outcome. After the second interview (conducted via Skype), I realized I had two options moving forward. I could play it safe and probably meld into the sea of dozens of other candidates who they’re interviewing, or I could take a risk and try to stand out from the crowd. By now, you know me well enough to know that I’m not the type to sit back and be a wallflower, so I decided to record a short, 30-second video and to send it to the producer. My hope was that she’d find the video funny and that it would help me stand out from the rest of the pack. But the risk was that she’d find it silly or, worse yet, she’d find it unfunny. Here’s the short video I sent the producer. My goal was to do something that a) stood out, and b) to let them know that I don’t take myself too seriously. The good news is that I did receive feedback from the production company — they liked the video and said they would be back in touch with me in the near future about next steps. I’ll keep you posted on the outcome. All of this raises the question about whether you should take risks with your corporate or personal brand. There are times when it pays to take a risk, and there are times when it’s best to play it safe. If you’re a well-established brand in the technology, airline, automobile or related industries, then it’s probably a good idea to play it a little safe. Note that I said a well-established brand in those segments. If you’re an unknown brand, then you might want to take some risks in order to differentiate yourself and gain some visibility. That’s what GeekSquad did many years ago when they developed their brand. At the time, they were an unknown company and they realized that they needed to do something to stand out. Geek Squad decided to take a calculated risk with their brand. They were a small company with a limited budget, so taking a risk was a good choice — and it paid off big time. Because they were a small company with a modest budget, they took a risk and played up the geek aspect of their brand. Fortunately, it worked. The company grew into a nationwide brand ultimately selling to Best Buy and making the founder, Robert Stephens, a wealthy man. When I sent the video above to the producer, I was taking a calculated risk. The way I saw it was that I really had nothing to lose because I have a thriving business and life is good as it is. I knew that if I didn’t take the risk, I might meld into the wash of other people they’re talking to. But if I did take the risk — and it worked — I could differentiate my personal brand enough to stand out from the crowd. So what are you going to do with your personal or corporate brand? Are you going to play it safe? Or are you going to spread your wings a little and take some risks? 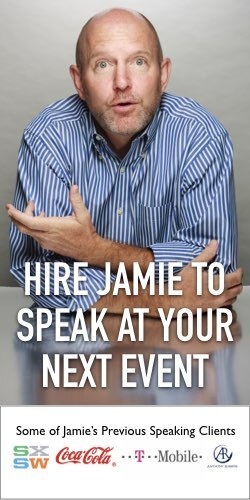 About the Author: Jamie Turner is the CEO of the 60 Second Marketer and 60 Second Communications, a marketing communications firm that helps businesses use the science of marketing to grow their sales and revenues. 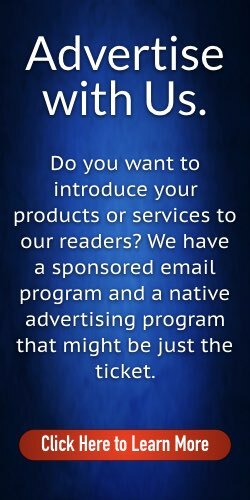 He is the co-author of “How to Make Money with Social Media” and “Go Mobile” and is a popular marketing speaker at events, trade shows and corporations around the globe.